UMP | University of Minnesota Press Blog: Sarah Stonich on memoir writing, truth, and Shelter. Sarah Stonich on memoir writing, truth, and Shelter. 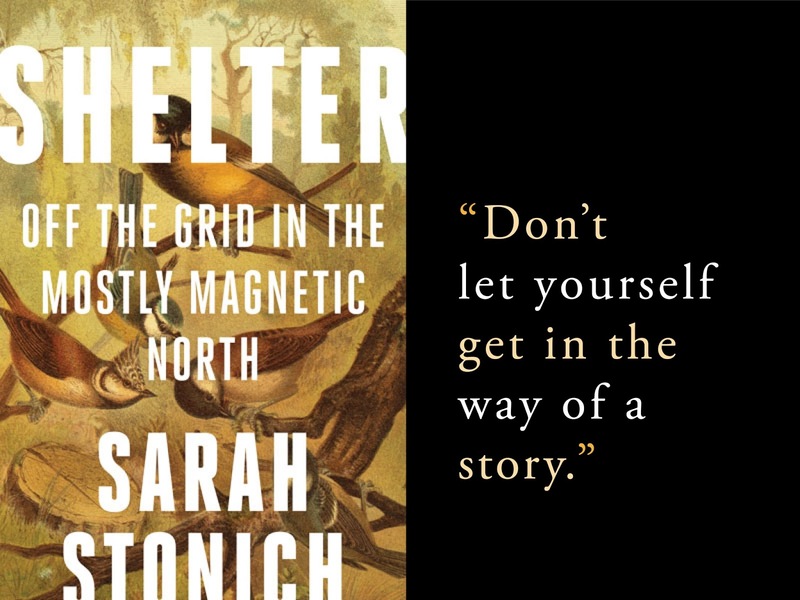 Upon the paperback release of Shelter: Off the Grid in the Mostly Magnetic North, author Sarah Stonich answers questions posed by BookFox. Both. I’d compare a good session of writing to a long day of stone-stacking or gardening. They are very similar in that you’re left exhausted in the best possible way, with tangible results. One is such a mental endeavor and the other so physical, yet the satisfaction is oddly similar. Q. If you could tell your younger writing self anything, what would it be? I was never a young writer—I assumed one couldn’t presume to write before accruing some life first, so didn’t write a word until my late thirties and wasn’t published until after forty. Knowing now that my most satisfying writing is not the product of experience but of imagination, I would tell my younger self to pick up the pen sooner. I would say trust your imagination to drive the work, spare yourself any pretense of control. Ditch the ego and don’t let yourself get in the way of the story. Q. How important is truth in memoir? I love Stephen Colbert's term "truthiness" but am alarmed at how honest reportage is labeled "fake news." Truth matters. But, because there are so few facts in a life, memoir may be the single exception where truthiness is acceptable. Can you remember a conversation verbatim? Probably not. Can a writer truthfully portray a story, a person a memory authentically without a list of facts? I think so. As a child I had a sort of epiphany I had no language for. I do my best adult imitation of describing that moment in Shelter—I typed out words, even though there was more to that experience than words can convey. Q. What memoirs have you read lately? I’m reading It’s Okay to Laugh: Crying is Cool, Too by Nora McInerny Purmort – a surprisingly uplifting memoir by a young wife and mother whose husband dies of brain cancer. Not the sort of story I’d normally seek out, but my family is currently taking a similar gut-punch. Nora’s story is reminding me there is a perverse nobility and strength that comes with death. Q. How many unpublished and half-finished books do you have? Too many—five? Seven? Probably ten. I like to think I will finish some of those half-baked efforts, but since new ideas for books are already elbowing in, the odds narrow. Q. What does literary success look like to you? Making a living wage is rare for most writers. Literary "stardom" is a dream. Realistically, success for me is being positively reviewed and acquiring a loyal readership. When something I’ve written has either touched or inspired a reader or made them relate deeply to a character, that feels like success. When readers take the trouble to write or post a review online, that’s even better. Hopefully, my books get read. Since financial security isn’t a realistic goal (buy books!) there is at least consolation knowing my efforts and words aren’t just dissipating into the ether. Q. Do you view writing as a kind of spiritual practice? No – it’s more like play. The act of stringing and juggling words and stories feels like self-indulgence, shirking the very adult and serious business of living. That said, there is the occasional enlightening moment, when the writing teaches me something. Things about my relationship with my husband, which I feel very protective of. And that’s all I’m gonna say! The Dublin stumble of writers pubs. The Twin Cities alone has enough literary history to plot out a great route for a pilgrimage. Canadians have a program called Bookmarks, placing plaques at the locales of literary landmarks to commemorate the books and authors. A few years back a map of MN authors was produced at some expense. If more were invested in a permanent literary trail, we could be a book tourist’s destination. When I finished Vacationland, I didn’t realize it wasn’t finished with me. Several characters wouldn’t let me go, and so that book has expanded into a trilogy. I’m just wrapping up Laurentian Divide and beginning research on book three. Q. 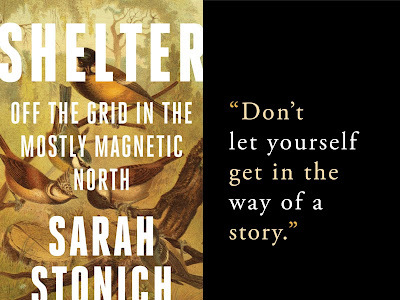 Will you do any events surrounding the paperback release of Shelter: Off the Grid in the Mostly Magnetic North? I usually enlist other authors and have a conversation surrounding a theme. ‘Paddling, Mushing, and Woodshedding’ will take place at Common Good Books at 7pm on May 18th with Julie Buckles, author of Paddling to Winter, and Blair Braverman, intrepid musher who wrote Welcome to The Goddamn Ice Cube. Sarah Stonich is author of the critically acclaimed novels Vacationland (Minnesota, 2013), The Ice Chorus, and These Granite Islands (Minnesota, 2013) as well as Fishing with RayAnne (writing as Ava Finch). The founder of WordStalkers.com, she lives in Minneapolis in a repurposed flour mill. 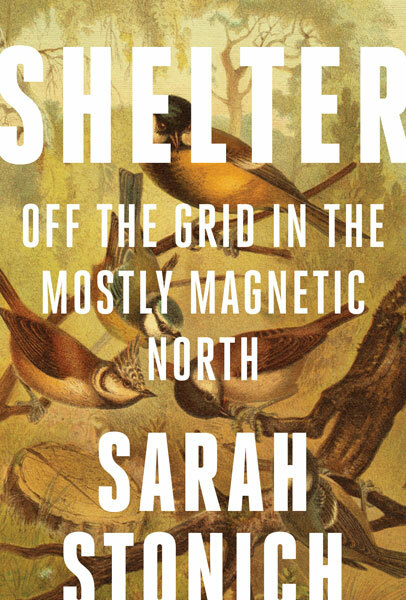 Shelter: Off the Grid in the Mostly Magnetic North is now available in a paperback edition from University of Minnesota Press.